Detailing the molecular makeup of materials—from solar cells to organic light-emitting diodes (LEDs) and transistors, and medically important proteins—is not always a crystal-clear process. Now, a team of researchers working at the Department of Energy’s Lawrence Berkeley National Laboratory (Berkeley Lab) has demonstrated infrared imaging of an organic semiconductor known for its electronics capabilities, revealing key nanoscale details about the nature of its crystal shapes and orientations, and defects that also affect its performance. To achieve this imaging breakthrough, researchers from Berkeley Lab’s Advanced Light Source (ALS) and the University of Colorado-Boulder (CU-Boulder) combined the power of infrared light from the ALS and infrared light from a laser with a tool known as an atomic force microscope. The ALS, a synchrotron, produces light in a range of wavelengths or “colors”—from infrared to X-rays—by accelerating electron beams near the speed of light around bends. The researchers focused both sources of infrared light onto the tip of the atomic force microscope, which works a bit like a record-player needle—it moves across the surface of a material and measures the subtlest of surface features as it lifts and dips. “Our technique is broadly applicable,” said Hans Bechtel an ALS scientist. “You could use this for many types of material—the only limitation is that it has to be relatively flat” so that the tip of the atomic force microscope can move across its peaks and valleys. Markus Raschke, a CU-Boulder professor who developed the imaging technique with Eric Muller, a postdoctoral researcher in his group, said, “If you know the molecular composition and orientation in these organic materials then you can optimize their properties in a much more straightforward way. “This work is informing materials design. The sensitivity of this technique is going from an average of millions of molecules to a few hundred, and the imaging resolution is going from the micron scale (millionths of an inch) to the nanoscale (billionths of an inch),” he said. The infrared light of the synchrotron provided the essential wide band of the infrared spectrum, which makes it sensitive to many different chemicals’ bonds at the same time and also provides the sample’s molecular orientation. 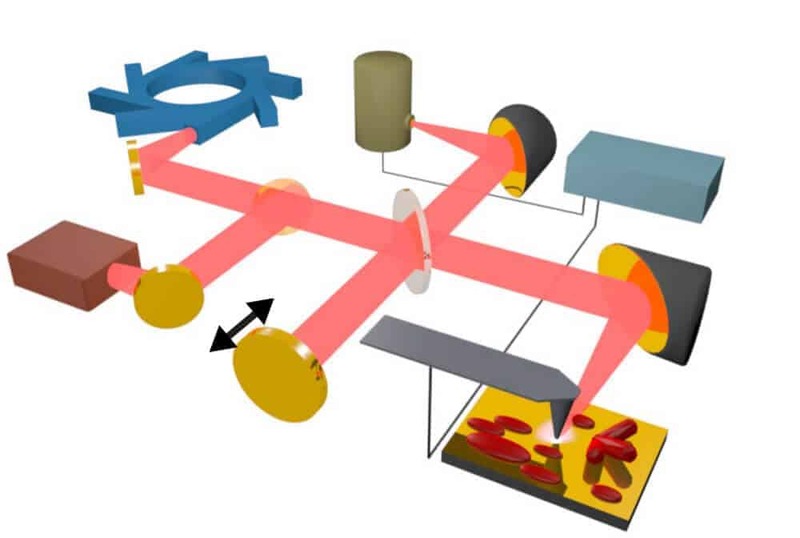 The conventional infrared laser, with its high power yet narrow range of infrared light, meanwhile, allowed researchers to zoom in on specific bonds to obtain very detailed imaging. The technique is particularly useful for the study and understanding of so-called “functional materials” that possess special photonic, electronic, or energy-conversion or energy-storage properties, he noted. In principle, he added, the new advance in determining molecular orientation could be adapted to biological studies of proteins. “Molecular orientation is critical in determining biological function,” Raschke said. The orientation of molecules determines how energy and charge flows across from cell membranes to molecular solar energy conversion materials. The imaging technique used in these experiments, known as “scattering-type scanning near-field optical microscopy,” or s-SNOM, essentially uses the atomic force microscope tip as an ultrasensitive antenna, which transmits and receives focused infrared light in the region of the tip. Scattered light, captured from the tip as it moves over the sample, is recorded by a detector to produce high-resolution images. “It’s non-invasive, and it provides information about molecular vibrations,” as the microscope’s tip moves over the sample, Bechtel said. Researchers used the technique to study the crystalline features of an organic semiconductor material known as PTCDA (perylenetetracarboxylic dianhydride). Researchers reported that they observed defects in the orientation of the material’s crystal structure that provide a new understanding of the crystals’ growth mechanism and could aid in the design molecular devices using this material.